I want to apologize for VO being out of so much stuff right now. Due to some production delays our latest container was shipped over a month late, but will arrive in two weeks. Another shipment is about 4 weeks out, so we should be re-stocked on almost everything pretty soon. Wheels will take a little longer since they must be built up after the rims arrive. We were taking inventory this week and found a bunch of miss-marked boxes of stainless steel fenders. How did that happen? They are 58mm wide and made for 650b wheels, but are also an excellent fit on 26" wheels. We're blowing them out. Need fenders for your 26" LHT? 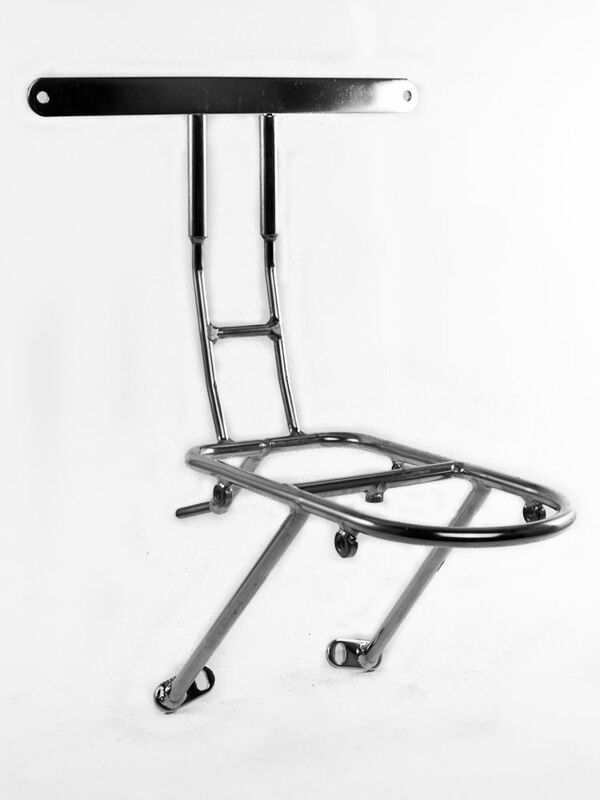 I'm a little disappointed that our regular front racks are outselling the models with integrated front decaleurs. I just want to tell you that the integrated front decaleurs are the way to go. They put the decaleur at the perfect height on any size frame. 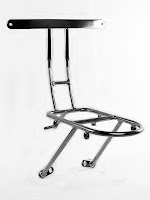 They weigh less than a separate decaleur and rack, and they are easier to install. If you don't need the decaleur you can just install the U-shaped "plug". 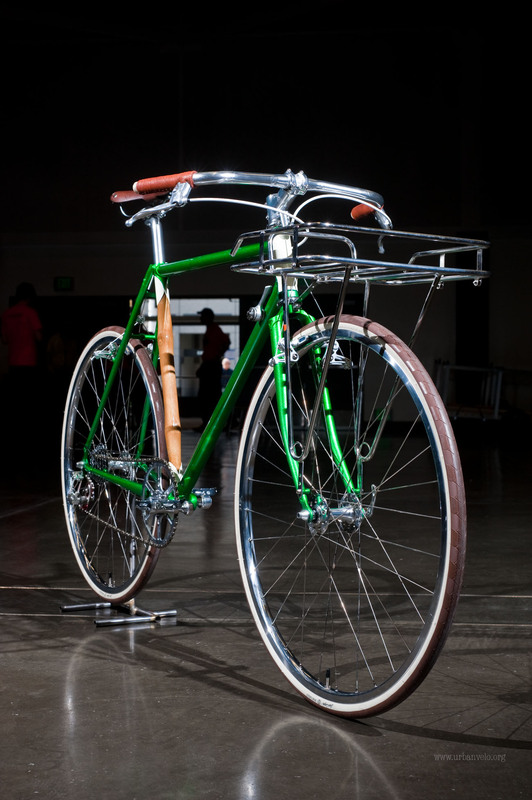 They are the only type of front rack I would put on my own bikes, except for the Porteur rack. 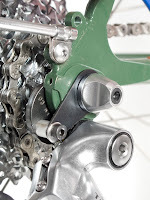 I first saw the Stein Mini Cassette Lockring Driver years ago when working in a little bicycle shop in the suburbs of Vancouver. They seemed like a great thing for the bike tourist heading out into the wilderness of Canada or Australia who wanted to make sure they were covered for all eventualities. The basic theory is that if you break a spoke on the rear wheel, taking off the cassette allows for a new spoke to be replaced easily. I see frames that have spoke holders on the chain stays, but if you can't take the cassette off, you can't replace a drive side spoke. 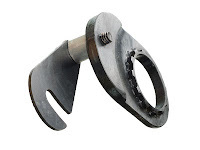 So when I was looking at ordering more of the Stein Crank Extractors (which sold really well over the past while) this winter, I thought this might be the time to order some for Velo Orange. I think these are great for the Boy (and Girl) scouts amongst us who like to be prepared. These are designed to fit on Shimano/Sram cassettes. (Sorry Campy fans, we'll have to see how well these sell and how much interest is in those). Small, light and made in Arizona by J.A Stein, folks with years of experience in making quality tools for bike mechanics, they weigh only an ounce and come in a handy little zip lock bag with the instructions. 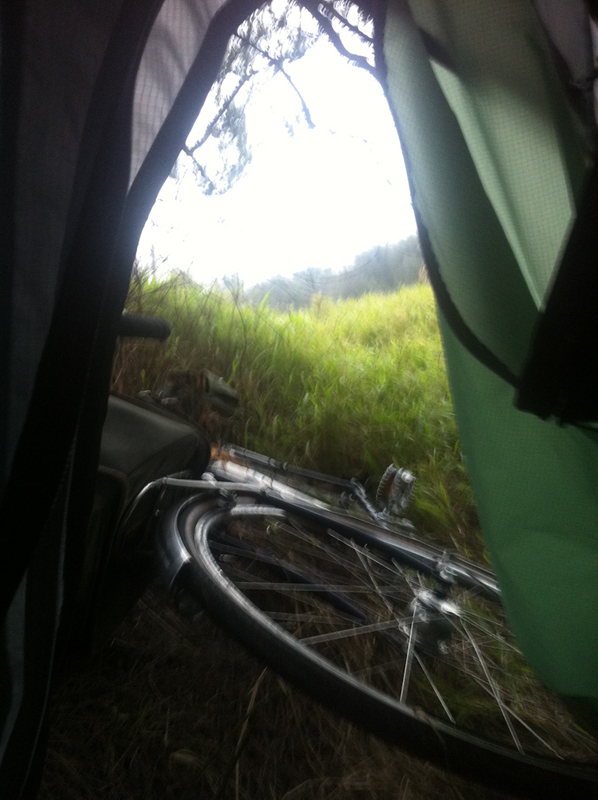 In terms of space on a bike tour, it's pretty much a non issue. Cassette removal (unless you have a Grand Cru free hub that doesn't need tools to disassemble) is one of those bike jobs that does require specific tools and this is one of those tools, but much much smaller and lighter than most. With it you don't need a big crescent wrench or anything, just hook it to your quick release skewer and spin the cranks forwards. 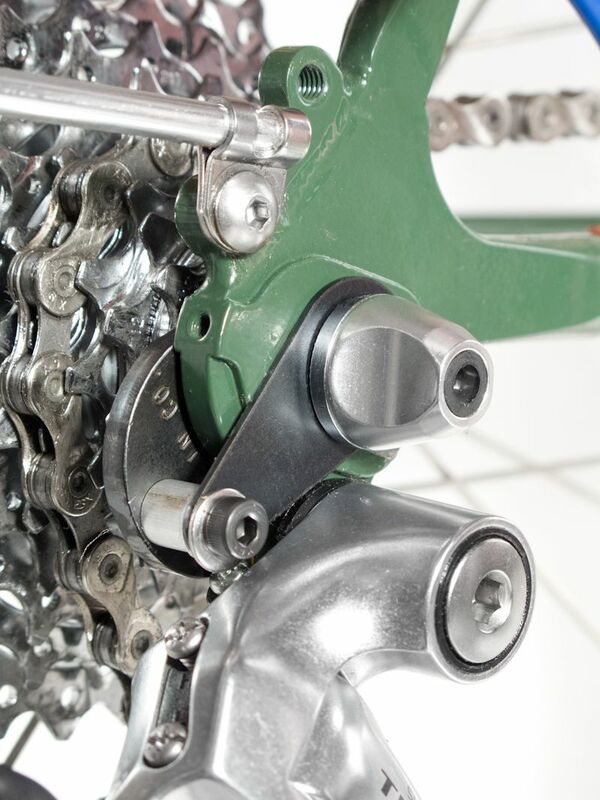 You can reinstall the lockring with the tool by spinning the cranks backwards when you're done. Even if you don't use it on a tour, it's a little piece of mind that you have in the tool roll “just in case”. Hey, even if you don't use it, perhaps you can play the role of super hero and help save someone else's tour. Jacob and John have company called Panda Bikes that makes Bamboo bikes. They're in Fort Collins, Colorado. Fort Collins, by the way, is also home to Swobo, New Belgium Brewing, RideKick, the FC Bike Co-op, the FC Cycling Festival, and a dozen great bike shops. I think there's something in the water out there. 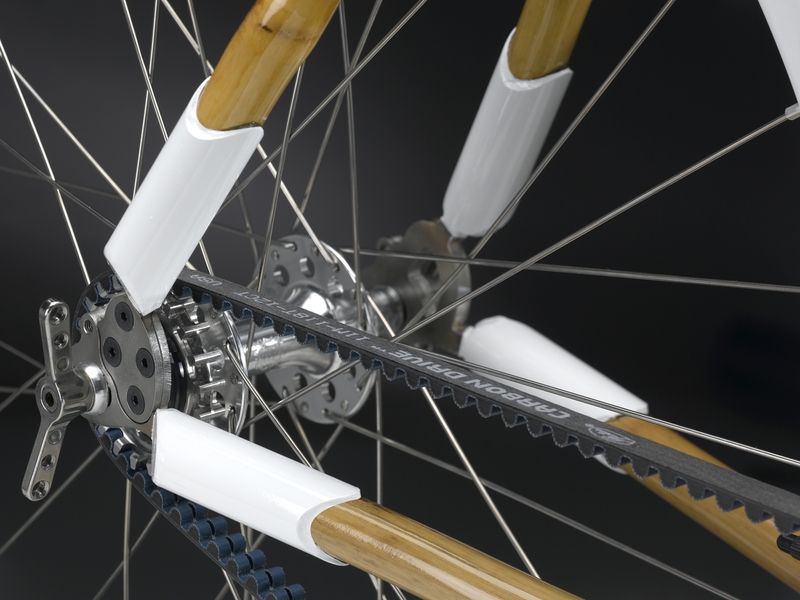 We wanted to outfit our bamboo bikes with beautiful, well made, and stylish components that you can't find anywhere else. What's more is that their company culture and outlook on riding is aligned with ours. When we were talking to their team at Interbike last year, we both know that it was a great match and started working together immediately. They've been good customers in the time between then and now and if you check out their website, you'll see that all of their complete bikes include at least a couple VO parts. Some of them have almost a full VO group, even. Take the Natural, for instance: where else can you find a bike with a VO stem, a healthy stack of headset spacers, leather bar tape, wine cork bar plugs, and a Grand Cru headset? Cool! Then there's the Action. A bike that comes stock with a porteur rack, wing nuts, the excellent Grand Cru Hubs, a 1x9 grand cru 50.4bcd drivetrain, VO leather Saddle, and grand cru seat post. That's pretty neat. There's also "The One," which is a belt-drive city bike, with Grand Cru fixed gear hubs, wing nuts, and a gorgeous center track carbon belt drive. That's really unique. And, lest you think that it's all a bit too commodifying, the frames are built by hand in in the USA. These are premium bikes, and we're glad to provide premium parts for them. These bikes are supposed to ride like a dream, as well. We haven't had a chance to ride one, but I think they're pretty unusual, using a blend of steel, lugs, and bamboo to tune the ride feel and make a really unique looking bike. Has anyone here ever ridden bamboo? What's it like? That tag line has always annoyed me in its urging unnecessary consumption, concomitant with boasts like, “I bought this backpack for $250 on sale, and it was a third off, so I saved $125!” - when the buyer already owns five other backpacks. Really? In some cases, however, the encouragement is based on truth and is not simply a ruse to trick the customer into buying more. For our international customers this is the case. We've shipped internationally since VO began. Yes, it costs us a bit in labor, and yes, it's a headache, and yes, there are delays in getting quotes to the customer and collecting the shipping. Our procedures for international shipping have never changed: you must place an order, we tell you how much postage will cost once we've packed and weighed it, you can reject or accept the shipping options, and we'll issue an immediate merchandise refund you if you cancel. We've investigated this process time and time again, and we've always concluded that, given the weird size-to-weight ratio of many of our products, this is the fairest way of assessing postage costs. It is usually better for international customers to order more at one time, for two reasons. First, the shipping cost per pound decreases as the total weight increases. This is especially the case for orders that we can ship via US Postal Service. Second, however, is a more complicated consideration called “dimensional weight” that kicks in when we use air express services like Fedex. Dim weight is calculated by the box measurement, and shipping is charged on the higher of the two weights, dim vs. actual. For example, the weight of a box with a single set of fenders is 4 pounds, but its dimensional weight is 24. So it is to the customer's advantage to order more items that can be stuffed in the box, since s/he's paying for 24 lbs worth of shipping. As the box size increases, obviously, the dim weight increases, until the story gets really gruesome with frames. Thankfully, we have a very understanding and responsive team at Fedex, so when we scream that we're losing orders because shipping is too expensive to, say, Australia or Austria, we are not ignored. Effective last week, depending on weight/size/cost of your orders, international customers are receiving rate quote emails for both USPS and Fedex, with a strong recommendation for one or the other. In most cases, Fedex is beating USPS on both service and price except on the lightest, smallest packages. So, in terms of shipping costs: buy more! save more! I had to laugh when I saw today's NewYork Times piece about major retailers and their discovery of an international market. Oh, to be a scrappy upstart (h/t Pete Campbell). 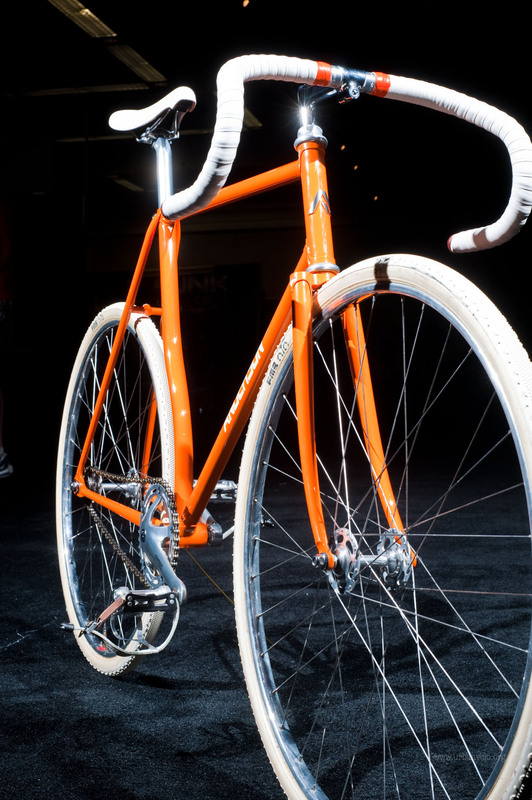 There was some great internet coverage of the North American Handmade Bike show, as usual. Even though we didn't make it to the show this year, we felt like we got a good idea of the bikes that were shown. I'm sure I missed some cool bikes, but here's a little selection of bikes using VO parts. They're all real stunners, huh? 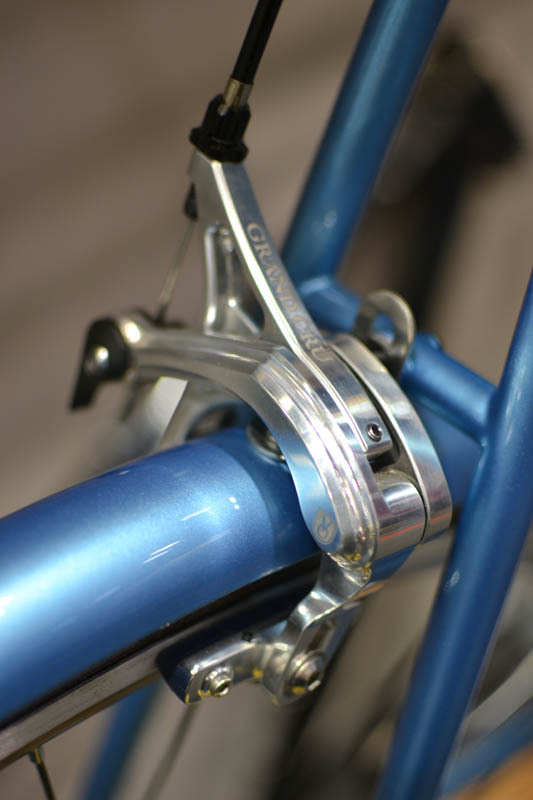 Urban Velo noted that our snazzy Grand Cru Long Reach Brakes were in evidence, along with many other VO parts. Grand Cru Seatpost made an appearance on Steve Rex's road fixie. Check out Steve Rex Cycles if you get a chance - he makes some really cool classic-but-different bikes. Our retro bottle cages and Tall Stack stem showed up on the Ventus bike. 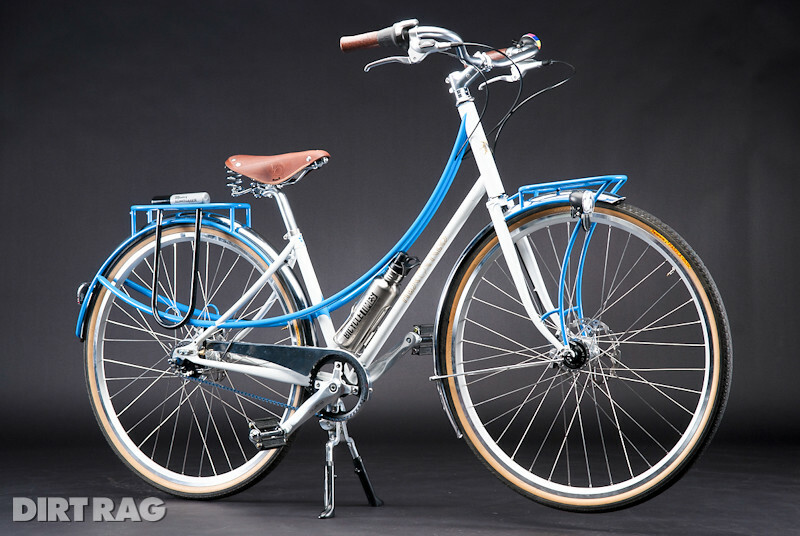 The mixte from Muse Cycles really impresses me. Look closely. It won Best City Bike this year, and is covered in VO parts. It's got a VO stainless bottle cage, threadless stem, threadless headset, touring saddle, porteur double leg kickstand, alloy chainguard, and the VO-spec Kalloy seat post. you can take a closer look at that bike on the a page on their website, and some great photos from ditrag here. There was also a cool creamsicle track bike with PBP rims. Panda Bicycles had the full Velo Orange treatment, with Porteur Rack, Belleville upright handlebars, Threadless Stem, Dia Compe 700c tires, grand cru Seatpost, VO Saddle, Grand Cru Touring Hubs, Raid touring Rims, customizable arm-only 50.4 bcd Crank with single speed hardware kit and single speed ring, and Grand Cru Cantilever Brakes. Note: you can click on any photo to see it bigger. I arrived at the airport late, unpacked and reassembled my bike, and disposed of its cardboard box. I gave my airplane reading (Blink) to a friendly security guy, who spoke excellent English with a pronounced Australian accent. I pedaled away into the night, unaware that this would be the last English speaker that I'd see until the show. 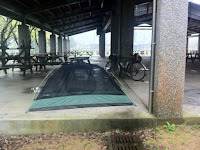 I planned to camp on the beach, and headed straight for the Strait of Taiwan, on the Western coast. 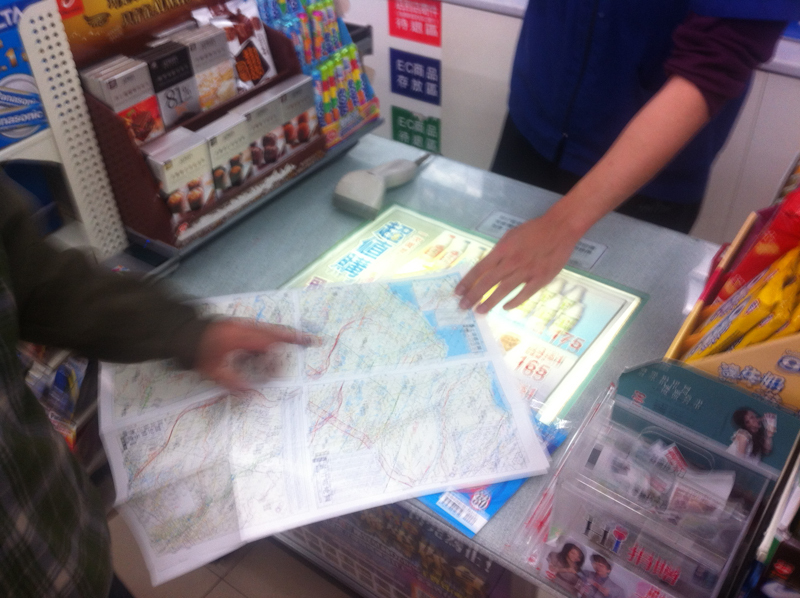 Lost immediately, I bought a map at a 7-11 and tried to convince the cashier to show me where we were on the map. He called his buddies over and we all pointed at various places, scratching our heads. No one knew where we were! 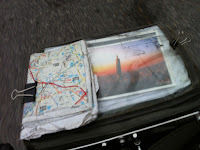 We gave up, and I was pretty lost, since all of the street signs in the area, and the map itself, were all in Chinese. All the names looked identical to me, and I mean that it the nicest possible way. So, I kept heading southwest, in the approximate direction of the beach I had in mind. It was a beautiful ride with a still night and a flat, wide road. It had an ample shoulder marked with stencils of a guy riding a bike, a good sign. Everyone else seemed to be asleep, so I took my time and enjoyed the warm air. I found a nice patch of grass next to the beach, slept. It was a nice, calm night, and when I woke halfway though, I realized that I was in a foreign country, with a vocabulary not extending much past "hello," and "thank you." I thought maybe I should be afraid. This wasn't exactly an official campsite, I could be easily misunderstood. I was alone. But, I was completely comfortable and unafraid. I would be for the entire trip, and I'd come to realize that I was surrounded by a kind, gentle, understanding people, who despite the language barrier would feed me when I was hungry, and point in the general direction of a city for me when I squeaked out the Mandarin name for it. 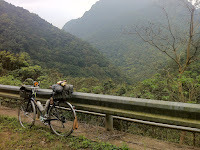 I get the impression that there's not much crime in Taiwan, and I never once felt threatened, not even by heavy traffic. 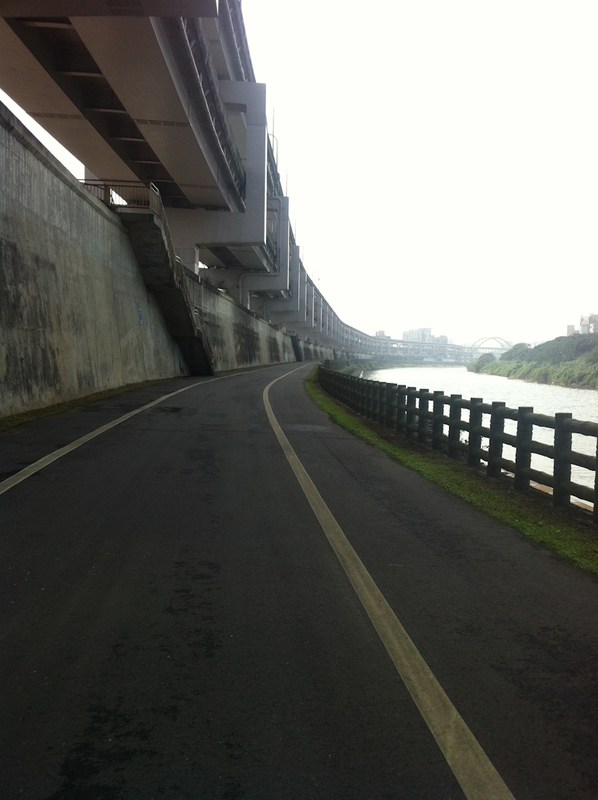 I woke up to a beautiful morning, finding myself on the Taoyuan Seashore bike path, as a sign in English proudly proclaimed. 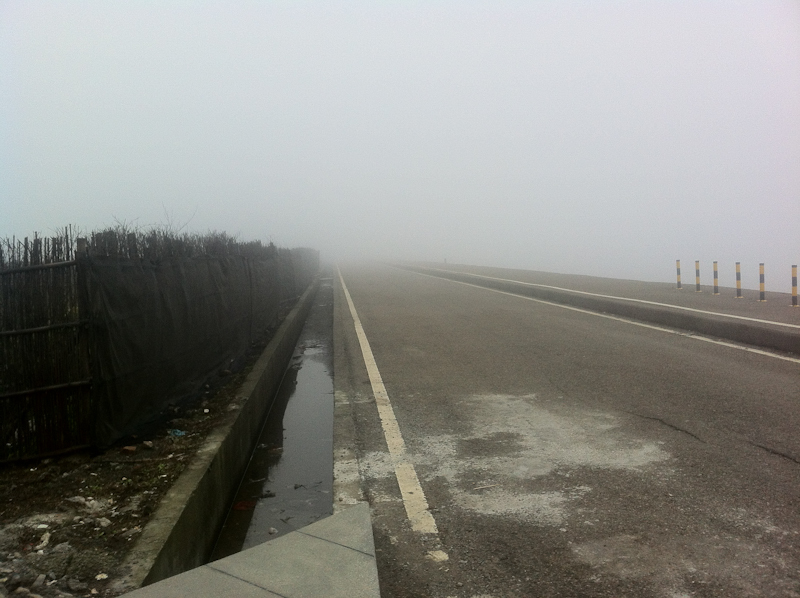 It was covered in dense fog, and I was comfortably alone on this Wednesday morning. 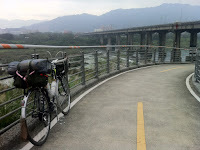 There seem to be a lot of bike paths in Taiwan, as well as small roads that serve as defacto bike paths, having only occasional, local, and courteous car traffic. This one was blanketed in fog, and I was alone, waiting for the GPS to figure out I was on the other side of the world, so I rode in what later seems to be circles on the coast looking for the road that would lead to the mountains. 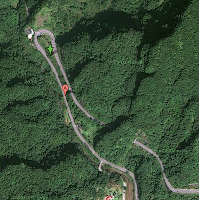 When the GPS woke up I zipped up the road towards the Wulai district, the mountains, and the hot springs. My destination was the "public" hot spring, and I didn't know much about it except that I hoped I could make myself welcomed there by the locals. I didn't want to go to an expensive private spa. First, I would get to cycle though a couple towns, the most notable being Taoyaun City. Here, I was first exposed to the ubiquitous motor scooter. The operators of these strange machines seemed to all be having a ball, and every intersection was equipped with a bike box for them. 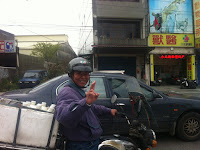 This guy seemed to be carrying milk, or something like it, and we rode together for almost the entire length of the city. The bike boxes in the intersections meant that we could outpace the cars by a good bit by filtering forward at the lights. 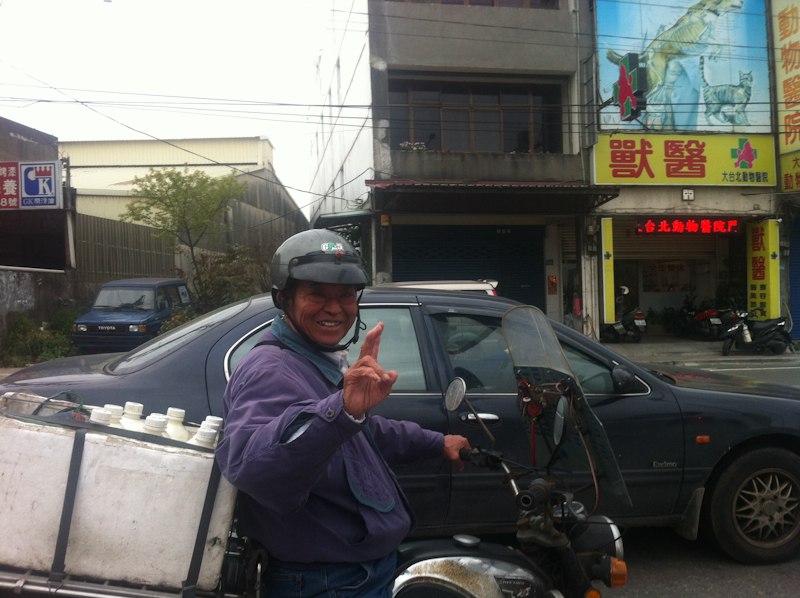 The scooters, truly, seem to be king of the road within the Tiawanese city. I also had the opportunity to ride some nice bike paths. 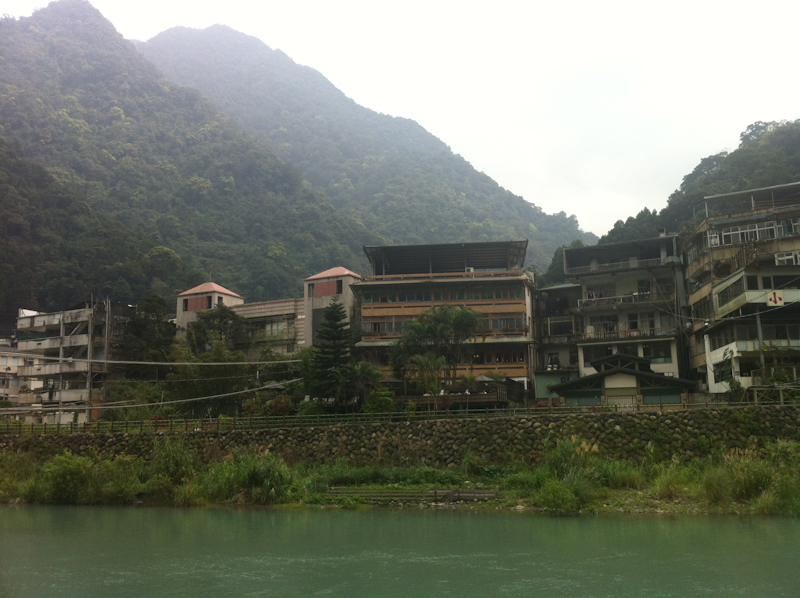 This one is in the Yingge District on the far side of Taoyaun, at the edge of the mountainous interior. After crossing some big river that I can't name, the road turned upwards for real and I pedaled through the Sansia district. I began to notice that even though I was now well out of the big cities, development didn't taken on a sprawly character the way it tends to around here. The towns were very dense, and private, freestanding homes seemed to be quite rare. The towns also seem to usually have public toilets. Listen up, bike tourists! 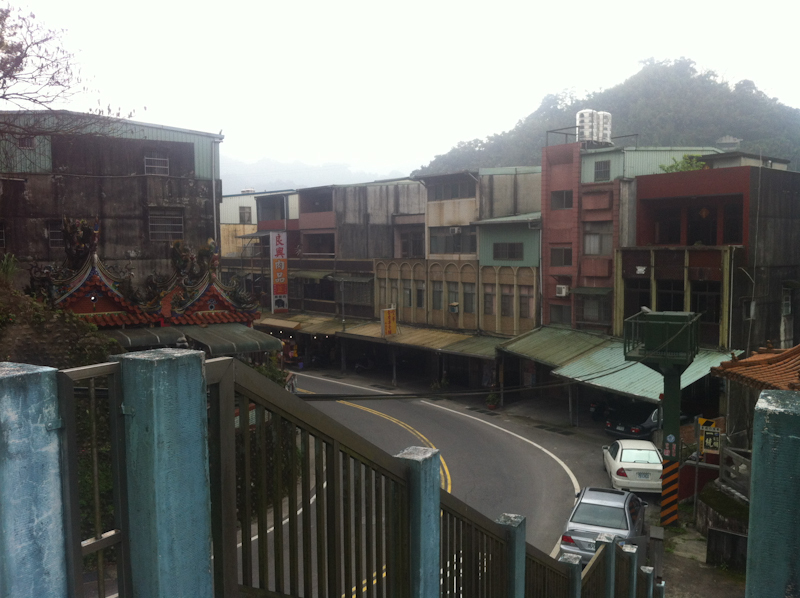 And then, I was in Wulai district for real. The town is cut down the middle by a wide, slow, cold river. Next to the river is the road, which turns into a public market full of indescribable and unidentifiable food, and delicious noodle shops. On the far side of the river, the public hot springs is a small park cut out of the bank of the river. 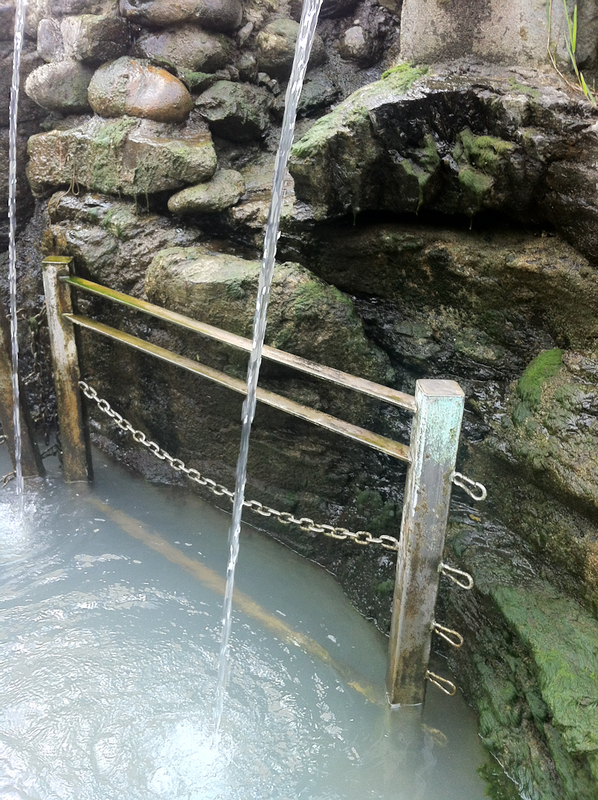 It seems to be maintained by the public, with rough concrete steps, small manmade pools, and PVC pipe festooned about carrying water of all temperatures from one place to another. I squeezed past about a half-dozen local families and found myself alone on a set of steps below everyone else, equipped with two piping hot streams of water emptying into a small lagoon in the freezing cold river. Great place for a mid-day bath! 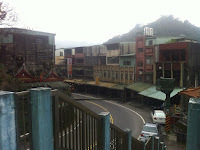 Like many other places in Taiwan, the building was delightfully dense. Can you well which is a dwelling, hotel, restaurant, spa, or store? Some of them are all of the above! I had some more noodles afterward, chuckling about our various states of weirdness with the shop owner, who was wearing a getup that seemed to be straight out of 80s pop, with splatter decals, stripes, florescent colors, and backwards cap. He seemed to think my bike was pretty funny, too, so we got along well. I headed out of town then, I climbed the switchbacks, up, up, and up to the top of the mountain. As it would turn out, the road would end a little earlier than I hoped, turning into first a large dirt road, then a small dirt road, then a small path. I bumped along the trails, climbing more and more, really enjoying a bit of offloading, but hoping I wasn't overdoing it (the wheels use VO Hi-lo hubs, PBP 700c rims, and Pasela tires, and as always, they were perfectly happy to bounce around on the dirt trail, even with 25lbs of camping stuff). 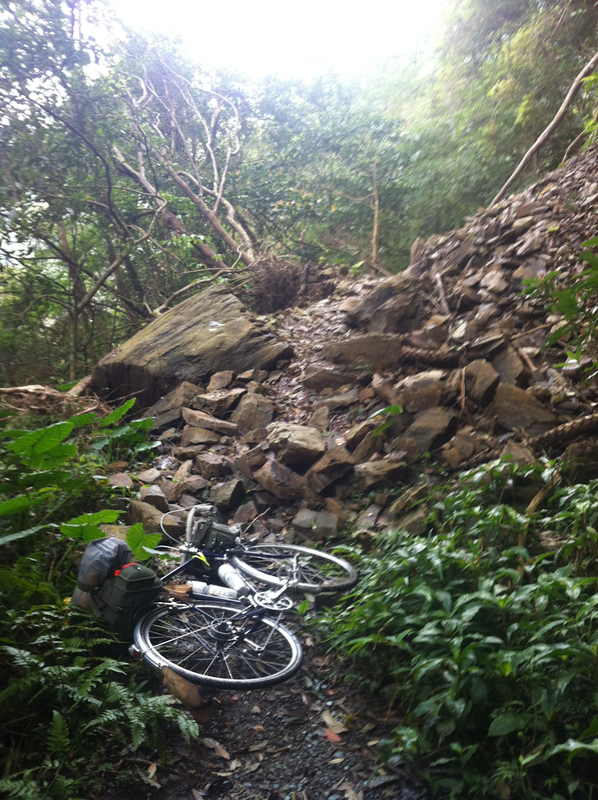 Soon, though, I came to a rockslide, which I had the pleasure of carrying my bike across, and on the other side, things got narrower and narrower until I walked the final mile to my campsite. Another half-mile on from there was the end of the trail. 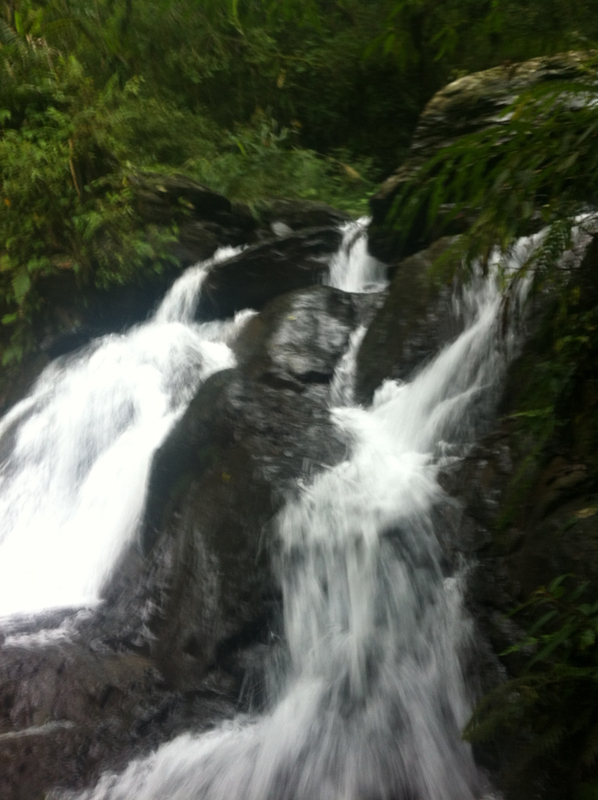 It was a gorgeous site at nearly the top of the mountain, where three waterfalls, one from each compass point, came together to form one big stream, flowing off in the fourth direction. 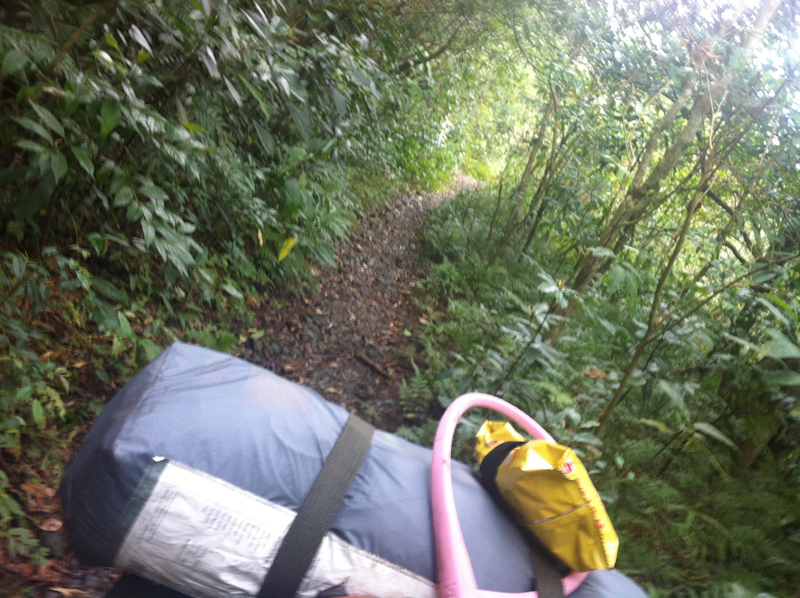 I'd learn later that this was a fairly well-known trail, and one of our friends in Taiwan had hiked it as well. After a quiet night at the top of the mountain, I backtracked and headed towards Fulong. 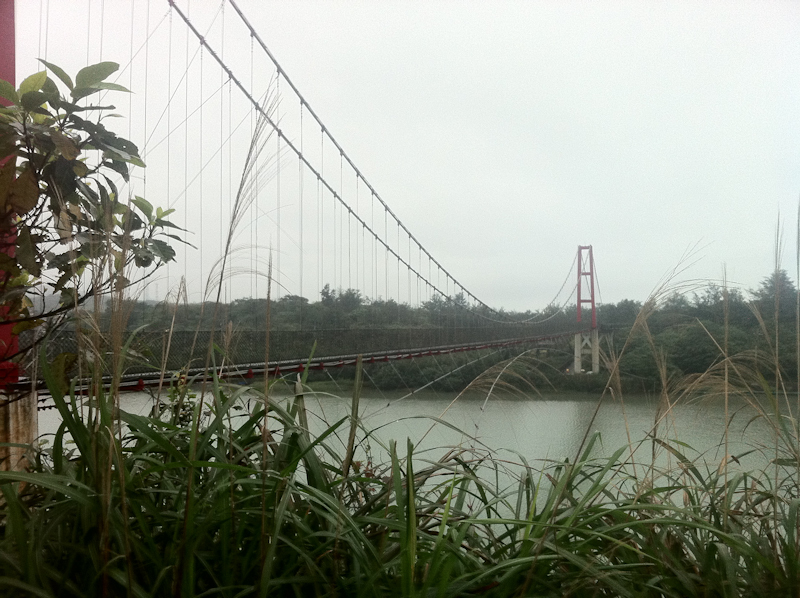 This meant a brief trip through the North end of Taipei, near the Zoo, and then another series of mountains to climb and descend. It was full of wicked switchbacks, like this one in the Shihding district. 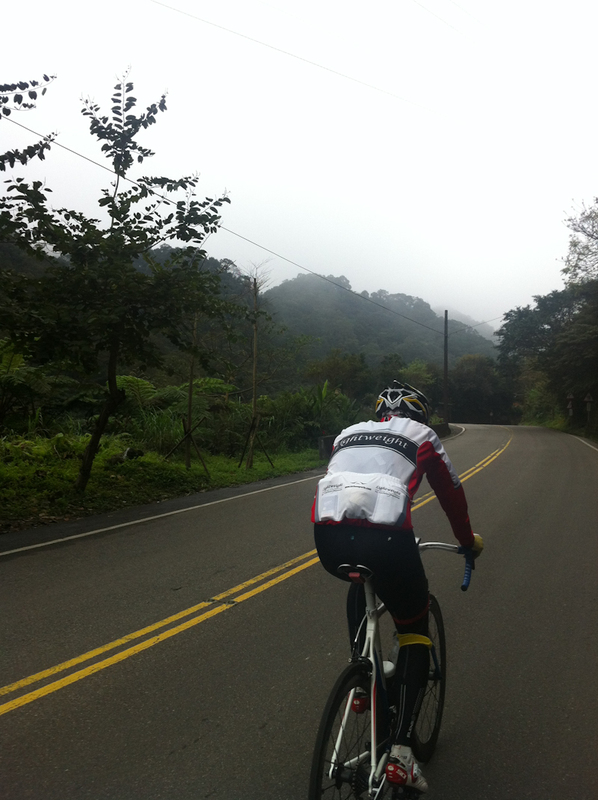 I had the opportunity to ride with some local roadies, as well. They seemed to all have pretty nice bikes, and I think this guy was a little bothered that I could keep up with him, the universal reaction of the roadie. 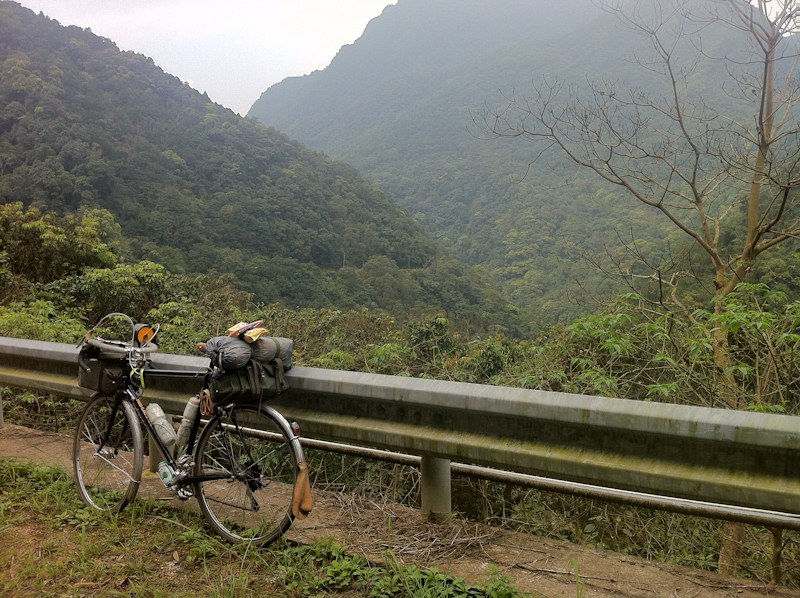 He stopped to eat at the top of the mountain, in a small town in the Pingsi district, and I kept going. It started to rain, then, and I put on my jacket before heading through some long tunnels under the peak of the mountain. Soon it was raining hard and I was wet all the way through. I had put my tent up wet in the morning, and it was time to imagine how nice it would be to sleep in a soggy tent that night. When I arrived in Fulong, it was raining so hard I could hardly see, and the guy behind the counter at the (official!) campsite spoke enough English to tell me that I should camp under the pavilion. I tried not to do an excited happy dance as I pedaled over and unrolled my stuff to dry under the roof. The bathroom had warm water and showers, too. I was overjoyed. 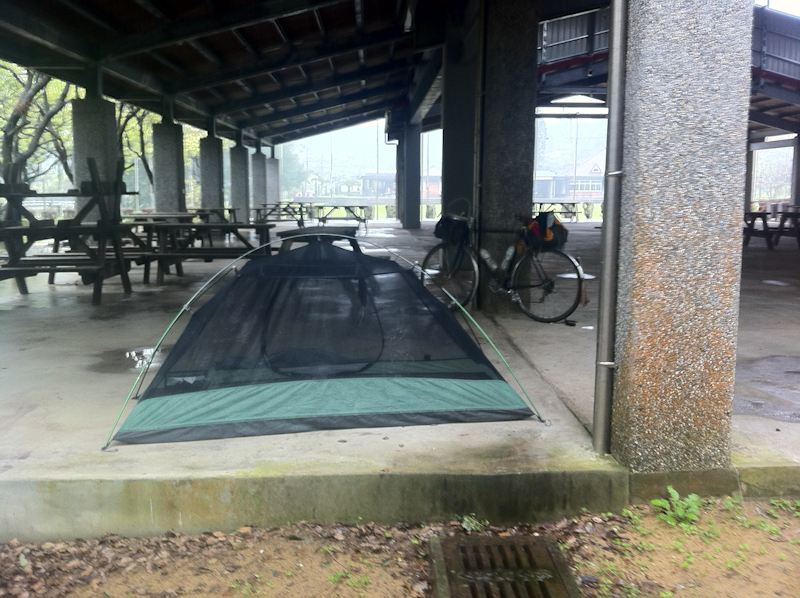 Then the rain stopped, and I rode to the town center and had some noodles, and the tent was dry by the time I got back. 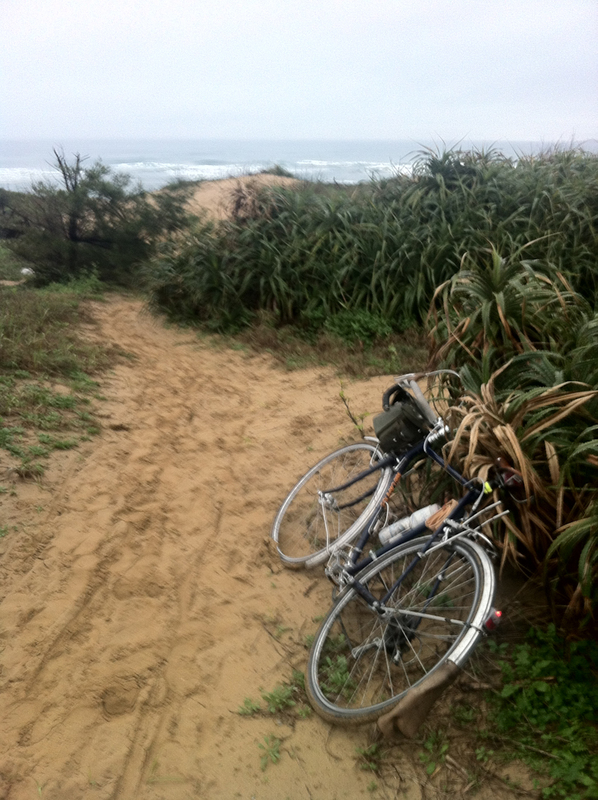 There was also a short bike path of a couple miles that lead down to the sea. The Phillipine Sea, this time. It was nice to spin along without my camping gear, and I was also reminded about how well this bike transitions from one role to another. The handling was impeccable both loaded and unloaded. 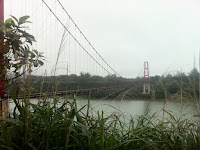 In the morning, I set out early and cut a zig-zag back to Taipei, through Keelung City, and then back out to the coast and around the Northern tip of the island back to Taipei. I tend to ride straight through. I don't like to stop, and with my big handlebar bag on its little rack, I can load up my meals and eat while I'm riding. But, on that day I made an exception and stopped in the early morning. Not for lunch, but for a haircut. It was a high-end looking salon in the small town of Nuannuan, and predictably, no one spoke any English. I pointed at my hair and my beard and made some snipping gestures and she hopped to it, giggling at my bravery. A cut, shave, and shampoo followed with few ill effects, and the charge was quite reasonable. All of our friends in Taiwan thought this story was hilarious. 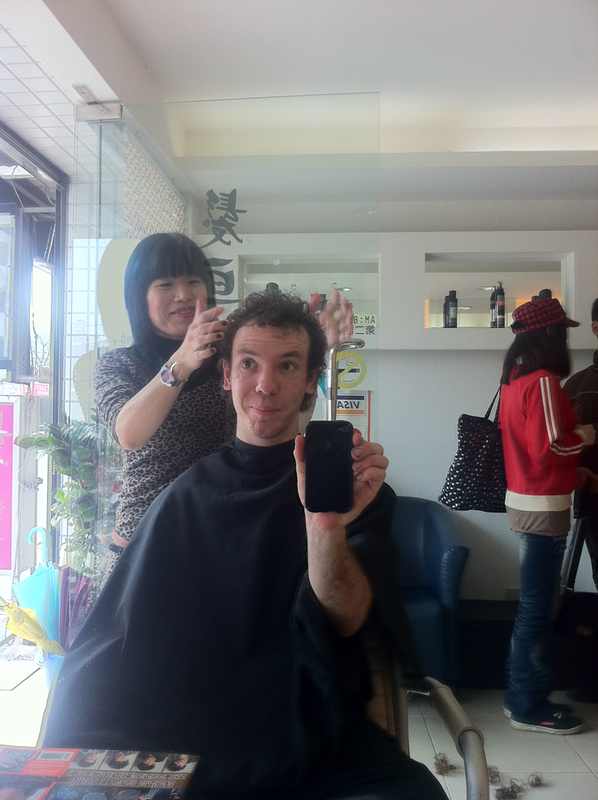 A haircut in a foreign language! And it looks okay! 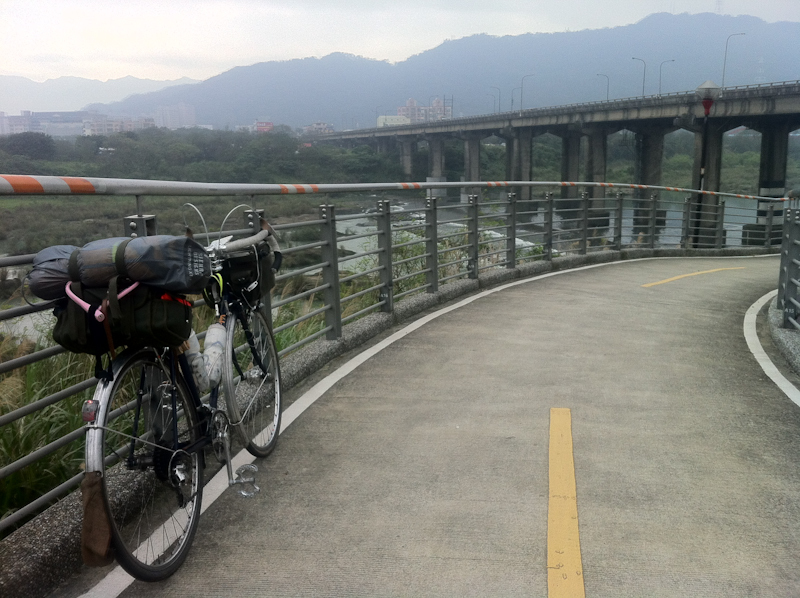 I rode along the river bike path in the Nangang district of Taipei, crossed the river, and headed back to the coast. 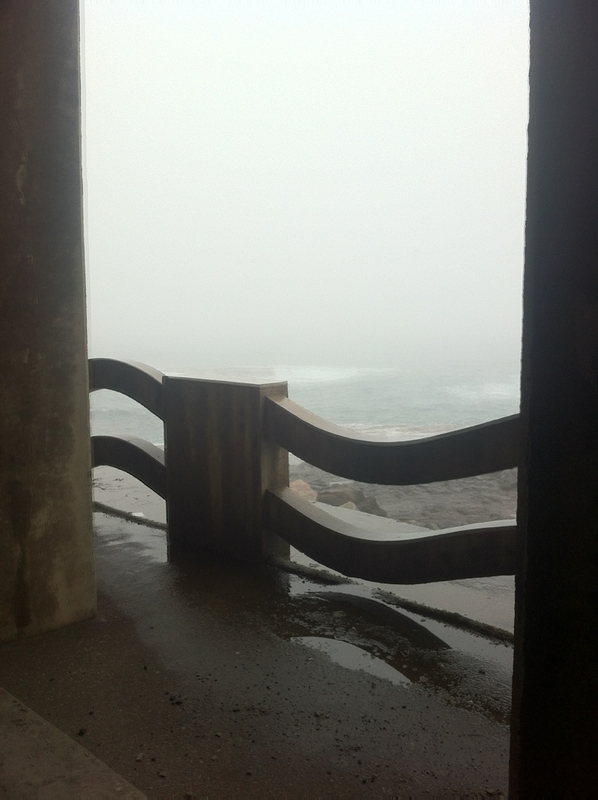 The coast was rainy and foggy, but was a wonderful mix of tunnels and hills and the road wound right along the edge of the water. Some of the tunnels were quite long, but the traffic was light and polite. Near Yunshan, in the Northeast, one of the tunnels was open on the side and had some wonderful concrete details and a sidewalk where you could look out on the ocean. This time it was the East China Sea. That's right, a third one! I think I missed one on this trip - the South China Sea. I wrapped up my trip and headed to Taipei to get ready for the show. 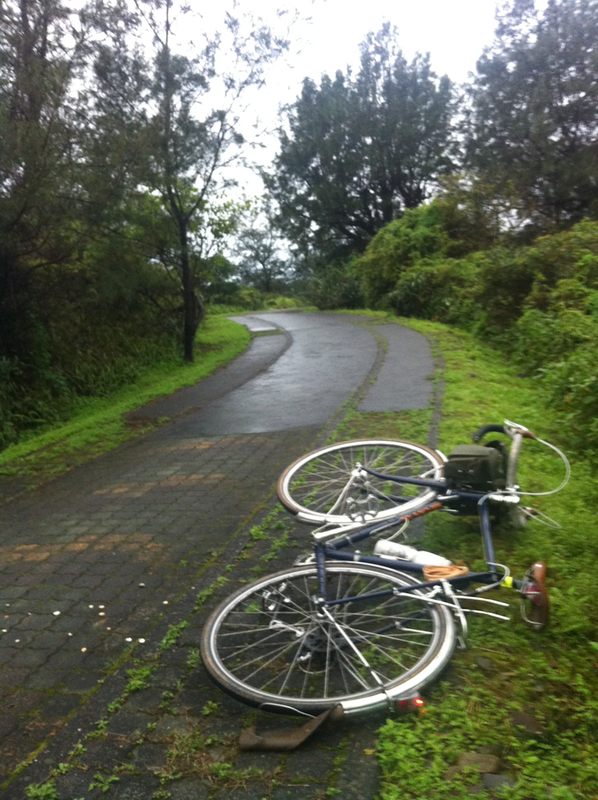 All-in-all, it was quite relaxing, and it felt natural and easy to ride on Taiwanese roads. Most of them had ample shoulders, and I shared even the most remote roads had scooters, so the cars knew how to behave around me. I was warmly received everywhere, and with an open mind.